Sulit.com.ph, the Philippines’ no.1 classified ads website, is set to shower its members with more prizes this Holiday season via their latest promo, Sulit Select. Offering an enviable roster of rewards befitting of the Christmas season, the promo lets four lucky Sulitizens take home prizes worth P10,000 to P50,000 beginning November 20 until December 14, 2012. 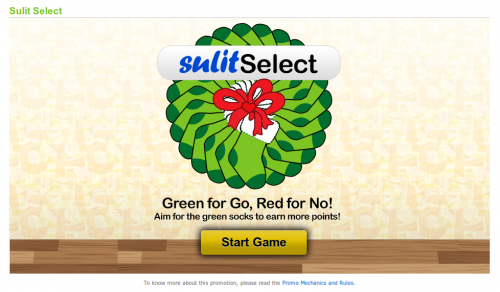 To join, Sulitizens can go to www.sulit.com.ph/SulitSelect to play the coin shooting game and accumulate as many credits as you can. The more credits you earn, the bigger the prizes you can put on your wish list. Each week, one winner will be chosen to take home his selected prize through a raffle draw. From the latest gadgets and rare collectibles to fashion items and accessories, users have full control of what they can win on Sulit Select. Only members with active accounts and current ad postings are eligible to join this promo. 1. Log-in to your Sulit.com.ph account and access the Sulit Select page. 2. Play the coin shooting game. 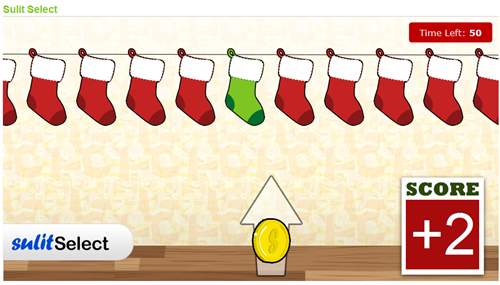 Shoot 10 coins inside the green stockings to earn points. * Note that the “Add to Wish List” button will only appear on the ad page when points are earned in the game. 4. Finalize your wish list and click submit. 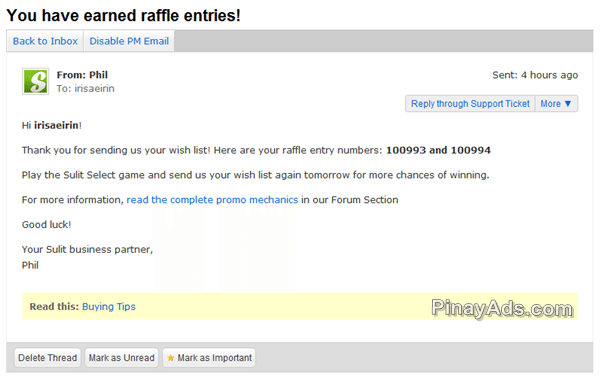 After submitting your wish list an automated message indicating your unique raffle entry number/s will be sent to your message inbox. 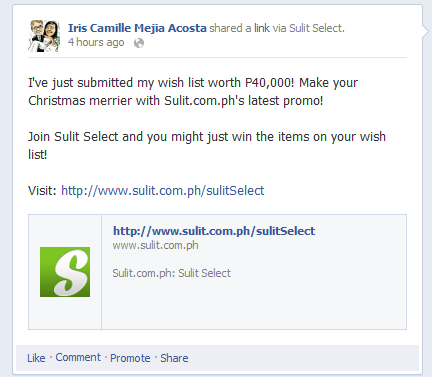 You have to click the “Share your wish list on your FB timeline” button to be able to receive your raffle entry numbers. *Note: If you click this button and you aren’t signed-in to your Facebook account, a message asking you to sign-in will appear on your screen. If you are signed-in, click “Allow” to your wish list appear on your Facebook Timeline. This confirmation will only appear on your account’s first integration with the Sulit.com.ph application. This is how it will look like when you share it on Facebook. ** Note that the post must be PUBLIC in order for the dditional raffle entry to be qualified for the draw. After successfully sharing your score on Facebook, an automated message indicating your unique raffle entry number/s will be sent to your message inbox. 6. All members who submitted their wish list is eligible to win on the weekly draw. 7. There will be 1 winner weekly. Winners cannot win twice. * Note that you may only send a wish list once per day. Visit http://www.sulit.com.ph now and be part of this season’s coolest gift-giving promo. Oh! I still have time to join the promo. I’ll the page for more details. thanks!